Abbasi, S., Zebarjad, S., NoieBaghban, S., Youssef, A., Ekrami-Kakhki, M. (2015). Thermal Conductivity of Water Based Nanofluids Containing Decorated Multi Walled Carbon Nanotubes with Different Amount of TiO2 Nanoparticles. Iranian Journal of Chemical Engineering(IJChE), 12(1), 30-40. S. Abbasi; S. M. Zebarjad; S. H. NoieBaghban; A. Youssef; M. S. Ekrami-Kakhki. "Thermal Conductivity of Water Based Nanofluids Containing Decorated Multi Walled Carbon Nanotubes with Different Amount of TiO2 Nanoparticles". 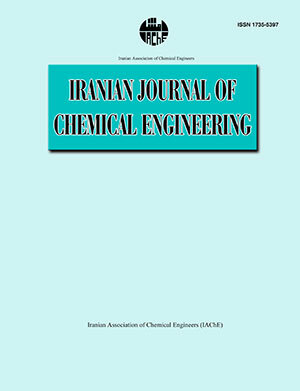 Iranian Journal of Chemical Engineering(IJChE), 12, 1, 2015, 30-40. Abbasi, S., Zebarjad, S., NoieBaghban, S., Youssef, A., Ekrami-Kakhki, M. (2015). 'Thermal Conductivity of Water Based Nanofluids Containing Decorated Multi Walled Carbon Nanotubes with Different Amount of TiO2 Nanoparticles', Iranian Journal of Chemical Engineering(IJChE), 12(1), pp. 30-40. Abbasi, S., Zebarjad, S., NoieBaghban, S., Youssef, A., Ekrami-Kakhki, M. Thermal Conductivity of Water Based Nanofluids Containing Decorated Multi Walled Carbon Nanotubes with Different Amount of TiO2 Nanoparticles. Iranian Journal of Chemical Engineering(IJChE), 2015; 12(1): 30-40. In this paper, we report for the first time, thermal conductivity behavior of nanofluids containing decorated MWCNTs with different amount of TiO2 nanoparticles. TEM image confirmed that the outer surface of MWCNTs successfully decorated with TiO2 nanoparticles. The results of thermal conductivity behavior of nanofluids revealed that the thermal conductivity and enhancement ratio of thermal conductivity of MWCNTsTiO2 at different amount of TiO2 nanoparticles are higher than those of TiO2 and MWCNTs nanofluids. Temperature and weight fraction dependence study also shows that the thermal conductivity of all nanofluids increases with temperature and weight fraction. However, the influence of temperature is more significant than that of weight fraction. We also found that decreasing amount ofTiO2 nanoparticles which introduce the outer surface of MWCNTs leads to the augmentation of thermal conductivity of nanofluids containing MWCNTs-TiO2. Wang, X. Q. and Mujumdar, A. S., “A review on nanofluids-part l: theoretical and numerical investigations”, Braz. J. Chem. Eng., 25, 613 (2008). Arani, A. A. A. and Amani, J., “Experimental study on the effect of TiO2–water nanofluid on heat transfer and pressure drop”, Exper. Therm. Fluid Sci., 42, 107 (2012). Choi, S. U. S., “Enhancing thermal conductivity of fluids with nanoparticle”, ASME FED, 231, 99 (1995). Xie, H. and Chen, L., “Adjustable thermal conductivity in carbon nanotube nanofluids”, Phys. Lett. A, 373, 181 (2009). Rurlle, B., Peeterbroeck, S., Gouttebaron, R., Godfroid, T., Monteverde, F., Dauchot, J., Alexandre, M., Hecq, M. and Dubois, P., “Functionalization of carbon nanotubes by atomic nitrogen formed in a microwave plasma Ar +N2 and subsequent poly grafting”, Mater Chem., 17, 157 (2007). Chen, L., Xie, H., Li, Y. and Yu, W., “Applications of cationic gemini surfactant in preparing multi-walled carbon nanotube contained nanofluids”, Colloids Surf., A, 330, 176, (2008). Huxtable, S. T., Cahill, D. G., Shenogin, S., Xue, L., Ozisik, R., Barone, P., Usrey, M., Strano, M. S., Siddons, G., Shim, M. and Keblinski, P., “Interfacial heat flow in carbon nanotube suspension”, Nat. Mater., 2, 731 (2003). T. Kyotani, S. N., Xu, W. and Tomita, A., “Chemical modification of the inner walls of carbon nanotubes by HNO oxidation”, Carbon, 39, 771 (2001). Xing Zhang, H. G. and Motoo Fujii, “Effective thermal conductivity and thermal diffusivity of nanofluids containing spherical and cylindrical nanoparticles”, Exp. Therm Fluid Sci., 31, 593 (2007). He, Y., Jin, Y., Chen, H., Ding, Y., Cang, D. and Lu, H., “Heat transfer and flow behaviour of aqueous suspensions of TiO2 nanoparticles (nanofluids) flowing upward through a vertical pipe”, Heat Mass Transfer., 50, 2272 (2006). Garg, P., Alvarado, J., Marsh, C., Carlson, T. A., Kessler, D. A. and Annamalai, K., “An experimental study on the effect of ultrasonication on viscosity and heat transfer performance of multi-wall carbon nanotube-based aqueous nanofluids”, Heat Mass Transfer., 52, 5090 (2009). Chen, L., Xie, H., Li, Y. and Yu, W., “Nanofluids containing carbon nanotubes treated by mechanochemical reaction”, Thermochim. Acta, 477, 21 (2008). Meibodi, M. E., Sefti, M.V., Rashidi, A. M., Amrollahi, A., Tabasi, M. and Kalal, H. S., “The role of different parameters on the stability and thermal conductivity of carbon nanotube/water nanofluids”, Int Comm in Heat and Mass Transfer, 37, 319 (2010). Talaei, Z., Mahjoub, A. R., Rashidi, A. M., Amrollahi, A. and Meibodi, M. E., “The effect of functionalized group concentration on the stability and thermal conductivity of carbon nanotube fluid as heat transfer media”, Int Comm in Heat and Mass Transfer, 34, 513 (2011). Raykar, V. S. and Singh, A. K., “Dispersibility dependence of thermal conductivity of carbon nanotube based nanofluids”, Phys. Lett. A, 374, 4618 (2010). Honga, H., Wright, B., Wensel, J., Jin, S., Ye, X. R. and Roy, W., “Enhanced thermal conductivity by the magnetic field in heat transfer nanofluids containing carbon nanotube”, Synth. Met., 157, 437 (2007). Jha, N. and Ramaprabhu, S., “Thermal conductivity studies of metal dispersed multiwalled carbon nanotubes in water and ethylene glycol based nanofluids”, J. Appl. Phys., 084317, 106 (2009). Amiri, A., Shanbedi, M., Eshghi, H., Heris, S.Z. and Baniadam, M., “Highly Dispersed Multiwalled Carbon Nanotubes Decorated with Ag Nanoparticles in Water and Experimental Investigation of the Thermophysical Properties”, Phys. Chem., 116, 3369 (2012). Okpalugo, T. I. T., Papakonstantinou, P., Murphy, H., McLaughlin, J. and Brown, N. M. D., “High resolution XPS characterization of chemical functionalised MWCNTs and SWCNTs”, Carbon, 43, 153 (2005). HU, C. Y., LI, F. Y., HUA, L. and ZHANG, R. B., “A study concerning the pretreatment of CNTs and its influence on the performance of NiB/CNTs amorphous catalyst”, J. Serb. Chem. Soc., 71, 1153 (2006). Abbasi, S., Zebarjad, S. M. and Baghban, S.H.N., “Decorating and Filling of Multi-Walled Carbon Nanotubes with TiO2 Nanoparticles via Wet Chemical Method”, Eng., 5, 207 (2013). Zhao, L. and Gao, L., “Filling of multi-walled carbon nanotubes with tin(IV) oxide”, Carbon, 42, 3251 (2004). Incropera, F. P. and DeWitt, D. P. Fundamentals of Heat and Mass Transfer. In: Springer; (1996). Lide, D. R. in: CRC Handbook of Chemistry and Physics: CRC Press LLC; (2007). Das, S. K., Putra, N., Thiesen, P. and Roetzel, W., “Temperature dependence of thermal conductivity enhancement for nanofluids”, J. Heat. Transfer., 125,567 (2003). Chen, L. and Xie, H., “Surfactant-free nanofluids containing double- and single-walled carbon nanotubes functionalized by a wet-mechanochemical reaction”, Thermochim. Acta., 497, 67 (2010). Murshed, S. M. S., Leong, K. C. and Yang, C., “Thermophysical and electrokinetic properties of nanofluids–a critical review”, Appl. Therm. Eng., 28, 2109 (2008).